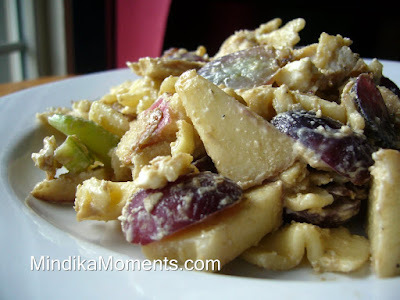 One of my absolute favorite salad recipes is this Chicken Waldorf Salad from CPK. I got the recipe from the CPK cook book several years ago, and it's definitely a regular meal around here. One night a couple weeks ago I was getting ready to make this salad for yet another dinner, when it hit me..."I should make this salad into a pasta salad. It was a fun twist on something we already love. Now I'm not sure which way I like it better! 1. Combine and toss the chicken, pasta, apple, grapes, celery and cheese. 2. Poor the Vinaigrette over top and toss again. Allow to chill in the refrigerator for at least 1 hour. I love the Waldorf salad from CPK. This looks delish. Do you omit the candied walnuts on the pasta version? I did leave out the walnuts for the pasta salad, only because I didn't have any on hand and I wanted to keep this super easy for a summer salad. But you could definitely add them if you have the time. I'm sure they would taste great.